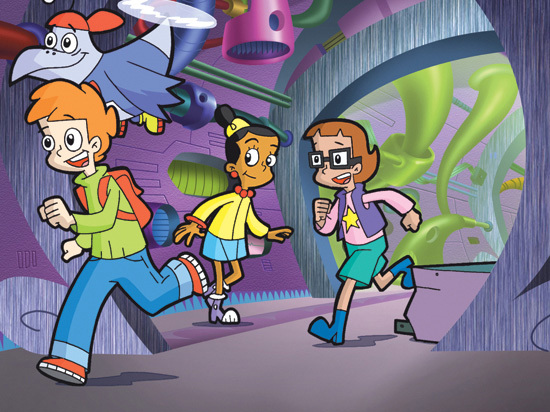 “Cyberchase” is an educational series that debuted in 2002 that’s meant to promote basic math skills (including trigonometry and pre-algebra) to grade schoolers. The show’s plot: three children repeatedly travel from Earth into an alternate “digital universe” called “Cyberspace,” which is inhabited by various robots/cyborgs and other creatures. Cyberspace is ruled over by “Mother Board,” a female figure resembling an LCD computer screen. The kids help protect Cyberspace from repeated attacks by the show’s villain, the Hacker (voiced by Christopher Lloyd of “Back to the Future” fame). The Hacker’s goal is overthrowing Mother Board and spreading chaos through cyberspace as its ruler. The three children (Matt, Inez, and Jackie) are usually accompanied on their adventures by Digit (voiced by Gilbert Gottfried), a bird-like creature dubbed a “cyboid.” Like “Futurama”‘s Bender, Digit has a chest compartment filled with almost everything imaginable. The show is pretty well done, and achieves its goal of teaching general math skills. Later episodes also helpfully expanded to applying math to other areas. These include basic engineering skills, weather patterns, and money management. Unfortunately, the newer episodes also converted from traditional 2D animation to Flash-based animation. As a result, the show’s distinctive look suffered (in my opinion) for it. The series is produced by Canadian animation studio Nelvana, who animated the early 90s “Beetlejuice” cartoon. Jackie is one of the three main human characters in the series. Contrary to math stereotypes, the show’s human heroes consist of two female characters and one male character. Thanks to this and the show’s other female characters, “Cyberchase” also passes the Bechdel Test. Jackie’s often the most melodramatic member of the group. However, she’s also depicted as putting a big emphasis on organizing and planning information. Of course, those two skills are highly useful for math. This also ties into her occasional running gag, a dislike of getting dirty or dealing with gross situations. One example is an episode where Jackie had to walk through a pyramid’s scarab beetle chamber.